Symphony Placement’s is excited to attend Staffing World Convention October 25-27, 2016 in beautiful San Diego, California. American Staffing Association presents the largest expo and convention annually that enhances excellence for the staffing, recruiting and workforce solution industries. A special note this year, ASA is turning 50 years and a special celebration and history of the staffing industry will be showcased at this years convention. Wanda Smith has been a member of the ASA since her early years in the staffing industry. Since 2006 and founding Symphony Placements…..Celebrating our own special celebration 10 Years in Staffing Excellence, Wanda believes in industry associations and not only showing up to the events, webinars and conventions but more importantly being involved and sharing industry trends with the team at Symphony and Clients. Symphony Placements is on the move! One of the key to our team’s success is our relationships with our clients. Bringing harmony to clients workplace and staffing recruitment is key to our growth in our 10 year history. We are happy to announce a partnership with a large national provider who has trusted our services locally in call center staffing. Wanda Smith and Marta Chavatel are pleased to announce Symphony Placements has secured placements in Seattle, Washington in September! With our company positioned as a WOSB we are attracting large scale partners who have a requirement with women owned federally certified staffing providers. 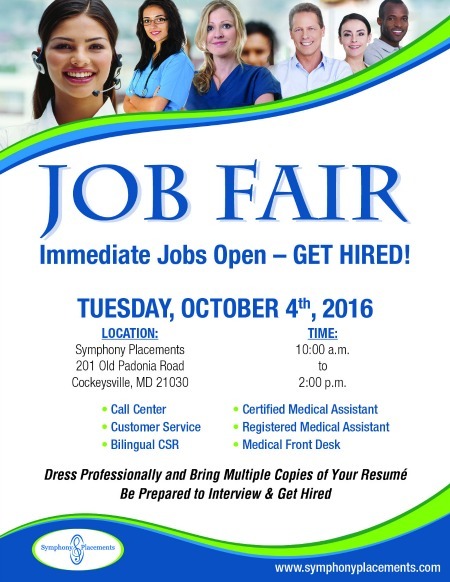 Symphony Placements announces our third hiring event of 2016! 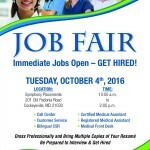 Tuesday, October 4, 2016 10am to 2pm our recruiters will be hosting same day interviews and skill assessment testing for immediate positions in the Baltimore Metro Area.